Some things do not make much sense. Take Tiramisú, for instance. It is definitely one of our favorite desserts, up there with Crème Brûllée and Oeufs a la Neige. However, after almost 8 years of food blogging, I do not have a single recipe for it in the Bewitching Kitchen. How could that be? I’ve made it in the past, but during this stretch of 8 years we’ve only enjoyed it in restaurants. To be completely honest, one example totally ruined us for other versions. 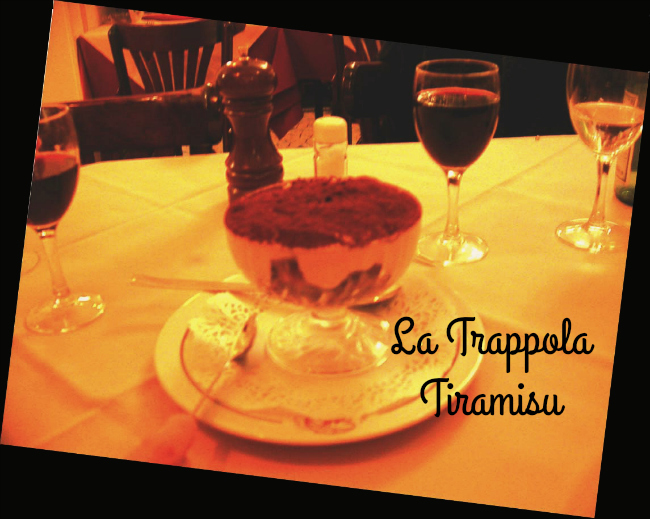 A small Italian restaurant in Paris, called La Trappola, very near our apartment in the 7eme had simply the best, the very best, the most awesome, delicious, luscious, fantastic, superbly addictive Tiramisú in the known universe. Before we left Paris, I tried to convince the owner to share his secrets, but no matter how much batting of eyelashes and smiling I did, he was unmoved. Acted like a real gentleman, but kept saying he wanted us to come back to his restaurant whenever we were in town. Yeah, as if Paris was a cab ride from Manhattan, Kansas. The humanity! Oh, well. I don’t have his recipe, but David Lebovitz shared his online, and I can tell you it made Phil and a couple of friends we had over for dinner very very happy. Oh, and me too! Mix together the espresso and rum. The mixture should taste strongly of alcohol. If not, add more until it does. In the bowl of an electric mixer beat the egg whites with a pinch of salt until they begin to get stiff. Beat in half of the sugar until stiff. Scrape the egg whites into a small bowl and reserve. Beat the egg yolks with the remaining sugar until stiff and light-colored, about three minutes. Beat in the mascarpone (still cold from the fridge) until lump-free. Fold in half of the reserved beaten egg whites, then the remaining half, just until fully incorporated. Submerge each ladyfinger in the espresso mixture for 3 seconds on each side, until soaked but not overly so. Layer them on the bottom of individual serving bowls. Top with mascarpone cream, grate semisweet chocolate on top. Add another layer of lady fingers, top with more cream. Cover and refrigerate for a few hours, preferably overnight. Right before serving, shower with cocoa powder and shave some bittersweet chocolate on top. Comments: At first I intended to make a recipe from America’s Test Kitchen, but when I realized the huge amount it made, I quickly moved away from it, but kept some of their special tips in mind. One of them: contrary to what most recipes advise, do not bring the mascarpone cheese to room temperature before beating it. It has a tendency to separate. It will result in a perfectly creamy texture if you whip it while fridge-cold. Yeah, mind blown. So that’s what I did. Worked like a charm. Also, I prefer not to over-soak the lady fingers, because I rather have a little bit of texture remaining in the cookie component. If you go by Lebovitz, he states “cut them in half to make sure they are saturated enough, they should be dropping wet.” Decide how you like it best, and do it that way. I wanted a recipe that would give us just enough for a dinner party with a couple of friends, and David’s version delivered exactly what I was looking for. I got the little glass dishes at Pier 1 Imports. They had only 6 left in stock, and by the time I left, their inventory dropped to two. It gave me a thrill to find exactly what I needed, one day before showtime. It’s not always the case, trust me on that. Was it as good as La Trappola’s? I am afraid nothing will match that version. Maybe being in Paris was part of it. Still, this was one spectacular dessert. At first I thought the portion was a bit too big. But next thing I knew, I was licking the spoon and staring at a clean little bowl. Such is life. Woke up next morning and went for a nice jog. Order of the universe restored! 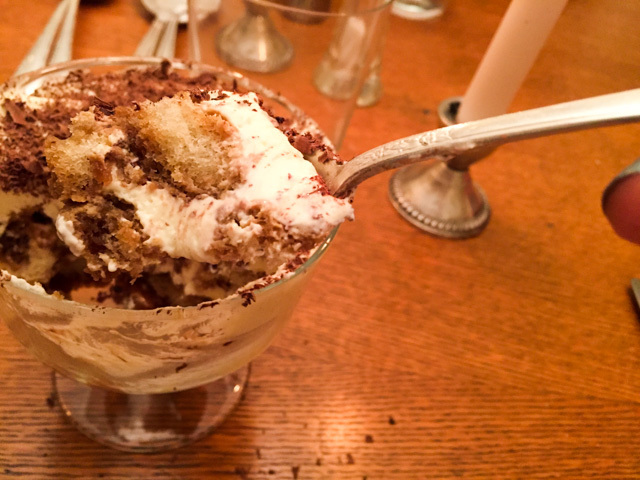 One at the entrance of La Trappola, and another of the Tiramisu of our dreams! 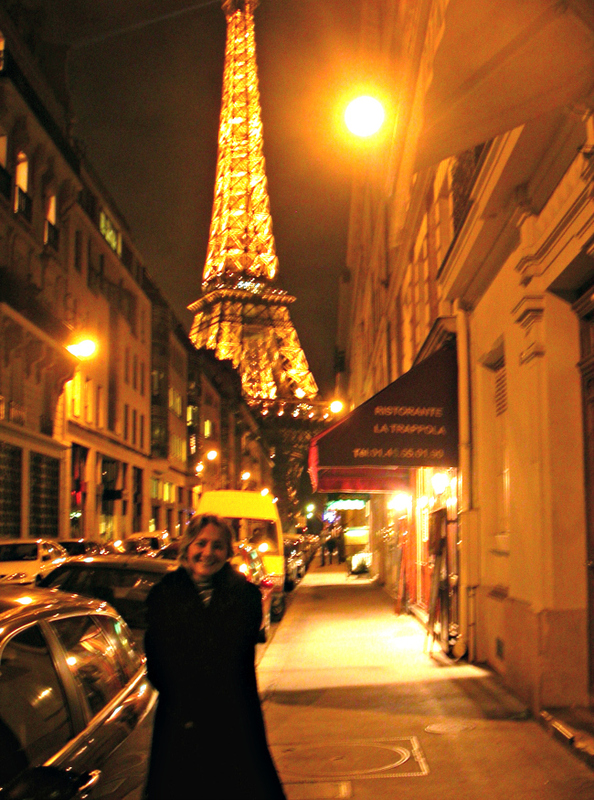 SEVEN YEARS AGO: Paris, je t’aime! How wonderful that Phil found those photos. That recipe sounds delicious. I’ve made Ina Garten’s but for some reason I’ve never posted it, even though it was delicious. Too bad we can’t just hop over to Paris whenever we want! Made this on the weekend, even including the lady fingers. With your expertise with macrons that would be a breeze for you. My recipe called for Marsala in the cheese part, but when the lady in the store told me it was a red wine, I kinda freaked out. I just couldn’t imagine what red wine would do to the mascarpone and egg mixture, curdling and horrible colour maybe.?? I bought in faith, really trusting those reliable food bloggers, and turns out it’s not red, but a gorgeous light amber colour, went beautifully in the cream. Oh, reading your comment I let go a huge scream NOOOOOO ! IT”S NOT RED!!!! glad you found that out, what was that woman thinking? Marsala is perfect of course! Trusting, but not reading well, I missed the part about layering the chocolate on the inside cream layer. I instinctively did some, I made it in 2 larger bowls, instead of individuals, just because it looked like it needed it. I like your idea of doing the top layer of cocoa at serving because it looked wet after chilling. I have half tub of mascarpone left, might give your rum in the coffee a try now. and of course, Marsala is SUPERB! He seemed like it! He gave me a suggestion for a ramen place to go to 🙂 I am definitely addicted to Parisian desserts – I wish more bakeries here had perfectly baked pain au chocolat! That was a magical evening, the colors of the photo turned out golden – the bright golden thing high up was indeed a full moon! Amazing…. 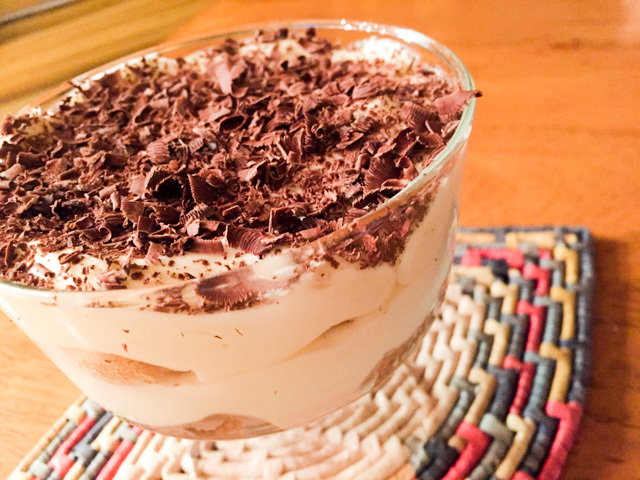 I’ve made tiramisu before but I’ve not done it in individual dishes so there are no leftovers – this is brilliant. I too love crème brûlée but it’s illes flottante that I race for when I visit Paris. Oeufs a la neige, snow eggs, floating islands – whatever you call them, I’d walk ten miles for one now. indeed, whatever the name that is the stuff of gods! I like to flavor the “cream” with a small splash of orange flower water, vanilla and rum. I can’t recall what French pastry chefs call the combination, but it is transforming ,adding mysterious depth to any dairy/egg dessert including floating islands! 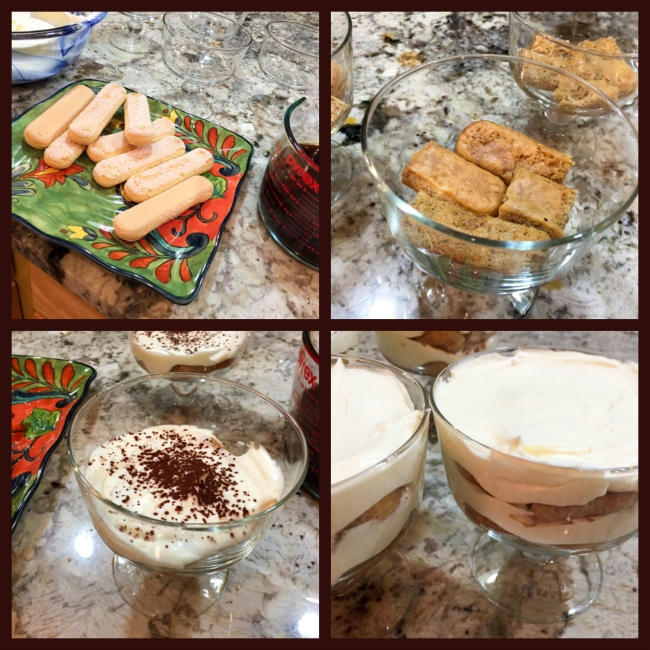 Tiramisu is my ABSOLUTE favorite dessert bar none! Yours looks sublime, thank you for making my day with just a glimpse of its sweet, creamy perfection! It is such a nice dessert indeed…. glad I brought good sweet vibes to you with my post! The mixture should taste of alcohol, darn tootin’ Sally. Otherwise, it’s jus the dull trifle that you’re eating. It WAS delicious, Sally, and just as sweet as the company! What a wonderful evening! Thanks again for having us. Oh, what a wonderful surprise to see you here! You’ve “found” me! AWESOME! yes, we had a lot of fun, should do it again… stay tuned! It WAS delicious, Sally, and just as sweet as the company! What a wonderful evening. Thanks again for having us.